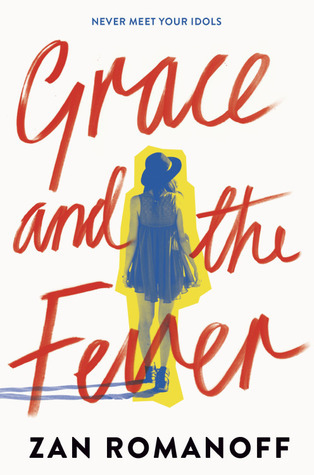 We are delighted to be joined by Zan Romanoff as she shares with us more about her latest novel, GRACE AND THE FEVER. Zan, what was your inspiration for writing GRACE AND THE FEVER? I was reading a blog post about how people could take fandom skills and translate them onto resumes-- like, most teens on Tumblr know more than I do about website coding, video editing, etc. And I thought about the people I knew who were deeply into celebrity conspiracy theories, and how they'd make great detectives-- especially if you gave them a more solvable case to pursue. GRACE didn't end up being a detective story, but it's very much about figuring out how fandom and the so-called real world intersect with one another, and whether or how it's possible to live in both. How long did you work on GRACE AND THE FEVER? I wrote the first draft super, super fast-- just under three months, writing two hours in the morning before work every day, and then usually on weekends as well. I was in a daze the whole time. I'm surprised I didn't get fired, honestly. It was the only thing I really cared about while I was drafting it. But that was almost two years ago now. It doesn't matter how fast you write-- publishing is always long. What do you hope readers will take away from GRACE AND THE FEVER? That getting the guy is usually the middle-- not the end-- of the story. But there's still no shame in having fallen in love. A book about Snapchat, hurt feelings, abandoned hotels, first forays into feminism, and what it means to let other people see you when you aren't sure who it is you're showing them yet. Zan Romanoff writes essays + fiction, mostly focused on food, feminism, television and books. She graduated from Yale in 2009 with a B.A. in Literature, and now lives and works in Los Angeles. Her young adult fiction is represented by Logan Garrison at The Gernert Company. If you want to get in touch with Zan about something (anything!) else, you can reach her at zanopticon at gmail dot com. Have you had a chance to read GRACE AND THE FEVER yet? What sort of fandom skills do you possess? What would your dream job with those skills be? Do you feel like sometimes getting the guy is what people focus on in stories? Share your thoughts about the interview in the comments!